The Brewing Forum • View topic - ACID SESSION (Hoppy Sour) - How to Hop? ACID SESSION (Hoppy Sour) - How to Hop? 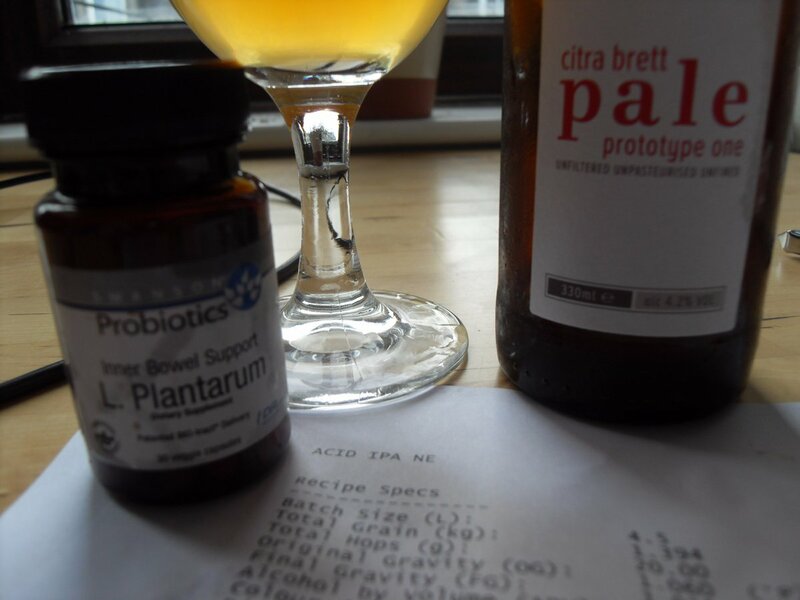 I enjoy beers by the likes of Chorlton and their beers such as Amarillo Sour and have been thinking of brewing something similar for a while now. In essence it's an ale with low bitterness, a moderately sour edge and a big dollop of aggressive hops. Sometimes too aggressive in that they smell like an IPA. Inspired by this and a post on Milk the Funk which led me to this recipe http://barlowbrewing.com/2016/08/16/acidulous-hop-trip-tart-ipa-with-devils-backbone/. 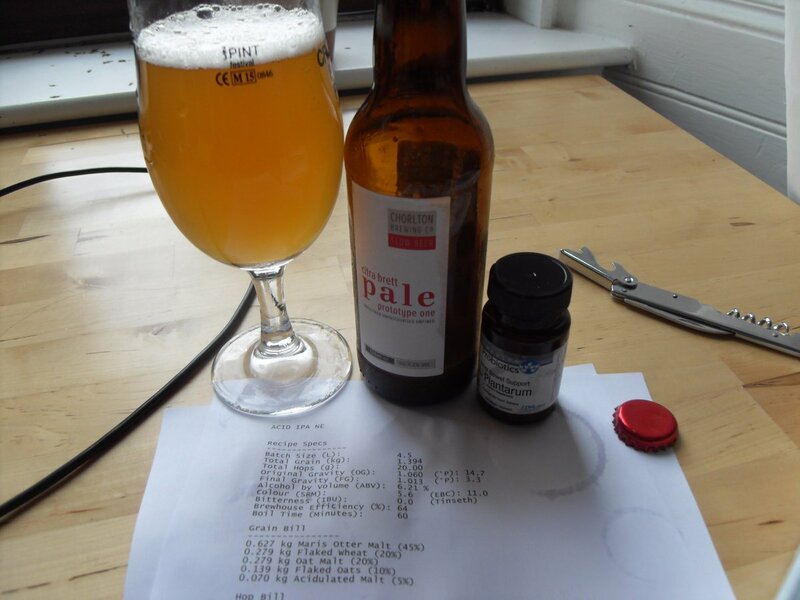 I was initially planning on cloning it (52% Maris Otter, 38% Pils, 7% Acidulated Malt, 3% Pale Crystal), or using my Berliner Weisse recipe, but instead I decide to adapt the first recipe to a grain and water profile more fitting of the hazy, fruity hop driven 'North East' beers. The aim here is to accentuate the malt and improve the mouthfeel of the beer, while promoting the hop flavour over bitterness to make a more approachable sour in the process. 4 - Dry hop - Standard dry hopping as beer approaches FG for four days. I'll be honest and say that I'm lazy. I don't really want to have to transfer the beer back and boil or heat it and with a sour you really don't want many IBUs as bitterness and acidity don't go well. This pulls me in the direction of a dry-hop only approach. I've had no staling or stability problem with unboiled sour beer to date, so that's not an issue for me. Any thoughts or opinions are welcomed! Day 3 - Pitch yeast. Re: ACID SESSION (Hoppy Sour) - How to Hop? I'd whirlpool with a low cohumulone hop. Less cohumulone = less aggressive bitterness in general. Finish it off with some dry hops. robwalker wrote: I'd whirlpool with a low cohumulone hop. Less cohumulone = less aggressive bitterness in general. Finish it off with some dry hops. I wish I'd brewed two demis of this, so I could split the batch. It'd have to be an 80c whirlpool as a 100c one would probably end up with around 30 IBU. I have some Citra and Simcoe that I'll probably put in this. I didn't whirpool prior to pitching the lacto initially as I feared it'd still impart enough bitterness to kill it. Not a worry once it's soured, then it's more about balance. I wouldn't take the flameout 100c/80c thing as gospel as plenty of evidence is pointing towards the temp not mattering heaps - time seems to be much more important. robwalker wrote: I wouldn't take the flameout 100c/80c thing as gospel as plenty of evidence is pointing towards the temp not mattering heaps - time seems to be much more important. That's my estimate of a flameout steep that normally seems close enough. I fear a whirlpool and double dry-hop is the best approach, but effort.. Cross-posted on Milk the Funk to see what responses I get there. Oh, I meant to say.. I was looking through some old stuff from label companies and I realised it included a black of Black Tap Brew Co. labels.. your old place right? A wee hitch with this beer, the pH has only dropped to 3.75 - not sour enough - and it's been about three days now. It's really time to either pitch the yeast or heat/hop/yeast. I don't know whether dry hopping will inhibit any further action from the lactobacillus, but it seems like my best bet..
Down to 3.5, but i'd pitched the Brett, so we're going for the dry hop only approach! 1g/l of both Citra and Simcoe in now 24 hours after fermentation began. The interaction between the yeast and hop oils should produce some different flavours and aromas. My hope is it's a bit more long-lasting than simple dry hopping. Either way it's an attempt to add more layers of flavour to the beer. There's lots of info on this out there and a good wee primer is available here:- http://www.homebrewtalk.com/unlocking-hop-and-fruit-flavors-from-glycosides.html. Although I don't fully understand enough of it yet to be honest. Gravity dropped to 1.009. and pH steady. This puts it up at almost 7% and it's still fermenting slowly. Almost ready for a second dry hop. This one just kept on fermenting. I haven't checked the gravity again but the airlock kept bubbling for weeks. Seems to be more or less at a halt now, but I'll bottle in 375ml champagne style bottles just in case. Final dry hop of Citra/Simcoe and Chinook has gone in and will get it bottled on Wednesday! Pleasantly tart, with a hint of hops for now. I remain unconvinced by ~6-7% simple sour beers like this and Buxton's Trolltunga. I don't think the extra alcohol really does much at all to the beer vs a 3% Berliner weisse malt bill. So this was surprisingly well received by the clubs and people I've send this out too recently. The acidity and yeast go together rather nicely and the lack of any real bitterness is just fine. All in all it came out relatively well balanced and complex. I'll have a look to see if I have any left!